Tell Congress to Save Student Aid in 2015! You are here: Home / scicu-news-releases / Tell Congress to Save Student Aid in 2015! America’s future depends on ensuring that all students have the opportunity to go to college. But, federal funding for student aid is under attack by Congress. 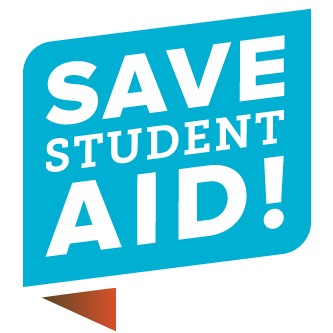 The Save Student Aid campaign is a national effort to pass federal legislation that will protect the programs that keep higher education—both private and public—within reach for millions of low-income students. During the past 5 years, Congress has cut funding for student aid by over $30 billion, resulting in students being kicked out of the Pell Grant program and being charged more for their student loans. These cuts were made to help balance the budget. This year’s budget proposal would freeze the Pell Grant maximum at $5,775 for the next 10 years and make student loans cost at least $3,800 more for students with need. By cutting student aid, lawmakers compromise America’s ability to lead an increasingly competitive world economy and send a signal that wealth, not talent, determines a student’s potential to succeed. Congress should not balance the budget on the backs of students. Add your voice to the growing course of supporters by going to http://act.studentaidalliance.org or https://twitter.com/StuAidAlliance or https://www.facebook.com/studentaidalliance?ref=hl. SCICU is in contact with South Carolina’s Congressional delegation in an effort to identify funding alternatives that will not compromise federal student aid.